One of Western North Carolina’s most celebrated visitors acquired his love of – and curiosity about – nature at his father’s side along the Schuylkill River just outside of Philadelphia in the late 1700s. William Bartram was born in 1739 (along with twin sister Elizabeth,) one of nine children to naturalist John Bartram and his wife Ann. John Bartram was a self-taught botanist whom Carl Linnaeus called the greatest natural botanist in the world. Bartram partnered with English merchant Peter Collinson who shared Bartram’s specimens with other notable European gardeners and clients like Mark Catesby, Phillip Miller, the Duke of Argyll and John Busch, whose nursery was the foundation for the prestigious Loddiges Nursery. In 1765, with considerable lobbying from Collinson and Benjamin Franklin, Bartram was appointed the King’s Botanist for North America by George III with a, very welcomed, pension of £50 per year. Plants would arrive in London in special crates designed by Bartram that ultimately became known as Bartram Boxes. The boxes usually contained at least 100 varieties of seeds and often dried specimens, as well. John Bartram along with his sons William and John Jr. were also credited with creating the first North American plant catalog in 1783. The catalog listed about 220 species of tree, shrubs and herbaceous plants. William followed in his father’s footsteps literally and figuratively. He accompanied his father on many collecting expeditions throughout the colonies and traveled solo through the Carolinas and Florida. According to legend it was Seminole Chief Ahaya that gave William the nickname “Puc Puggy,” which translated to flower hunter. William also followed in his father’s footsteps when it came to recording his excursions. John received some notoriety for his A Journey from Pennsylvania to Onondaga in 1743 and William’s Travels was the most influential natural history writing in America before Thoreau and influenced other romantic writers like Wordsworth and Coleridge. 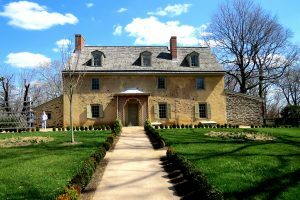 John Bartram and his family continued to pour their sweat and passion into the plot along the Schuylkill and the nursery flourished. It became the premiere nursery in North America and was believed to have introduced more than 2,000 North American species to European gardens. The business flourished under three generations of Bartrams until the economic downturn of the 1830s. In 1850 Ann Bartram Carr (a daughter of John’s) was forced to sell the nursery. Andrew M. Eastwick purchased the nursery and preserved it as a private park on his estate. Upon Eastwick’s death in 1879, his former gardener, Thomas Meehan organized a successful effort to preserve the garden and in 1891 it was taken over by the city of Philadelphia. Today it is a city park and is managed through a partnership between the city and the John Bartram Association. The site encompasses 46 acres along the river. Original structures include John Bartram’s home, circa 1728, a greenhouse, circa 1760, a small barn that was later expanded, by Eastwick, into a coach house and stables and the remains of an old cider press and mill. Gardens preserved include the Upper Garden, the William Bartram Quarter (species collected by William,) the Native Plants Quarter (plants selected from the 1783 catalog,) the Lichen and Bog Garden, the Fish Pond and the Ann Bartram Carr Garden. The gardens are home to the Franklinia tree. This small tree discovered by John and William Bartram along the Altamaha River in Georgia and named, Franklinia altamaha, by William in honor of his father’s friend Benjamin Franklin went extinct in the wild in the early 1800s. It is believed that all specimens of Franklinia today are direct descendants of the stock from Bartram’s Garden.